Somehow it's been a whole two weeks since I last blogged! 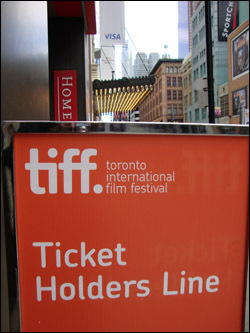 My sole excuse isn't a very good one because I ran into folks in downtown Toronto this past week who were watching 32 to 50 movies at the Toronto International Film Festival and I only saw five. FIVE! But between the travel time from the burbs to downtown, queing to pick up tickets from the Metro Centre on several occasions, queuing hours to get our pick of seats at the theatres, waking up early on certain days to attempt to score the freshly released tickets that become available on the day of screenings, well, those things seemed to be enough to throw off my schedule. Not that I'm complaining, because I love film fest time and I wish I had the stamina and $ to see more movies! I'm always sad when TIFF is over and the mad film/celebrity buzz around town disappears and we all have to return to real life and the fact that yes, it'll officially be fall in five days. and according to schedules and interest whittled the list down to the five bolded titles. My favourite was Page Eight, the festival's closing film which was written and directed by David Hare (writer of The Hours, The Reader and Plenty) and was shot in five weeks for British television on a budget of just three million dollars. Bill Nighy gives an outstanding performance as a veteran MI5 officer in possession of a secret document that asserts the British Prime Minister knew about incidences and locations of torture camps by the American government. Page Eight's dialogue is crisply intelligent in a way that most blockbuster films seem to have forgotten is even possible. While at the festival David Hare remarked, "It's very, very difficult to make films at the moment that are about human beings," adding that anything that isn't a blockbuster spectacle seems to be a tough sell. "One of the challenges was to make a suspense film in which there are not implausible killings. The death rate in modern movies is just absolutely unbelievable, if life were like the movies there'd be nobody left on this planet at all." If you weren't able to catch Page Eight at the festival and are into smart movies about smart people embroiled in political intrigue you might want to look out for it on PBS where it will air on November 6th. You can also check out the Roger Ebert review of Page Eight here. That brings us up to today's date which is eight short days until my new book, My Beating Teenage Heart, is released. I'm ever so happy to report that Omnivoracious, the Amazon blog has such nice things to say about the book including the following, "In the vein of some of my favorite novels of the past few years, namely Gayle Forman’s If I Stay and Jenny Downham’s Before I Die, Martins’ latest is the type of novel that will remain with you long after you’ve read the last page." Whoah. Thank you, Amazon! With the release date of My Beating Teenage Heart almost upon us I'm on blog tour starting tomorrow (an enormous thanks to Teen Book Scene for putting the tour together!) and running through to the end of the month. Here's the schedule and I'd be glad to see you stop by somewhere along the way to say hello! If you'd like to read My Beating teenage Heart be sure to enter the two tour giveaways. 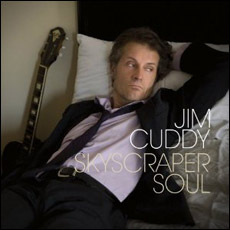 This year I happen to share a release date with Jim Cuddy's new album, Skyscraper Soul which is a big thrill. As a major Blue Rodeo and Jim Cuddy fan I won't fault you if you buy Skyscraper Soul instead of My Beating Teenage Heart but I'm sincerely hoping you'll pick up both! I'd like to end this entry with one of the songs that I think of as being part of the playlist for My Beating Teenage Heart the Queen of Soul, Aretha Franklin, singing I Say a Little Prayer.